How much do persons with disabilities benefit from education in developing countries? What is preventing them from participating in the labor market? These questions were examined at a seminar held May 19, 2015, by the JICA Research Institute to commemorate the publication by Cambridge University Press of "Disability, Education and Employment in Developing Countries: From Charity to Investment" by Kamal Lamichhane. Lamichhane is an associate professor at the Center for Research on International Cooperation in Educational Development, University of Tsukuba, and a former JICA-RI research fellow. This book summarizes the results of an analysis of the relationship between education and employment for persons with disabilities in developing countries, based on empirical data obtained from Bangladesh, Cambodia, India, Nepal, and the Philippines. 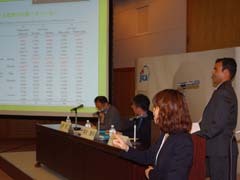 "This book is almost unprecedented in that it is based on empirical data, and it contains important suggestions for practitioners and researchers," said JICA-RI Director Ichiro Tambo in his opening address. "Any one of us could become disabled through old age, an accident, a disaster or in some other way, and creating a society that guarantees the social participation of persons with disabilities also means creating a society in which anyone can partake in the benefits," he added, explaining the significance. In his keynote address, Lamichhane gave an overview of the book and gave background on the life of persons with disabilities in developing countries. Some 15 percent of the world's population has some kind of disability and 80 percent of them are living in developing countries. Persons with disabilities in developing countries are the poorest in the world and have been left behind by society, Lamichhane pointed out. But the reality is that data on persons with disabilities has not been sufficiently accumulated and empirically researched and the effects of education have not been made clear, he said. Lamichhane estimated returns on investment in education for the persons with disabilities, which is based on an estimate of the relationship between length of education and wages. He also analyzed the causes of persons with disabilities being left out of the labor market. As a result, he made it clear that despite the returns to investment in education of a person with a disability being higher than that of a person who is mentally and physically normal, several factors are serving as barriers to their employment: the preconception that persons with disabilities are low in productivity, their low level of education and the difficulty they have commuting to work because of poor infrastructure. Lamichhane also pointed out that persons with disabilities' low level of education is greatly effected by their parents' lack of knowledge and understanding. "The important thing is shifting the paradigm from one of charity to one of investment, and changing social consciousness," he said. "There are many important contributions in this book, and one of them is the analysis of disabilities and education from the standpoint of investment through the concept of returns on investment in education. In the future there is a need to verify whether the knowledge gained from these five countries applies to other countries." 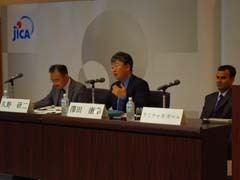 "This book presents the evidence we were seeking and at the same time sets out future issues including how JICA will deal with this evidence," said JICA Senior Advisor Kenji Kuno, who specializes in the field of disabilities. "What kind of research will you carry out in the future? And what kind of data do you need for it?" "It is difficult to gather evidence in developing countries; how did you gather it?" "This book focuses on physically handicapped people, but would it be possible to do an analysis of mentally handicapped people?" Lamichhane closed the seminar by saying, "I would like to carry on with my research by including more target countries and gathering data on people with mental disabilities as well."